Global markets were thrown into disarray as Donald Trump won the U.S. presidential election, shocking traders after recent polls indicated that Hillary Clinton would be the victor. Futures on the S&P 500 Index plunged by a 5 percent limit that triggers trading curbs and European equities sank the most since the aftermath of Britain’s shock vote to leave the European Union. Gold advanced with haven assets including the yen and sovereign bonds. 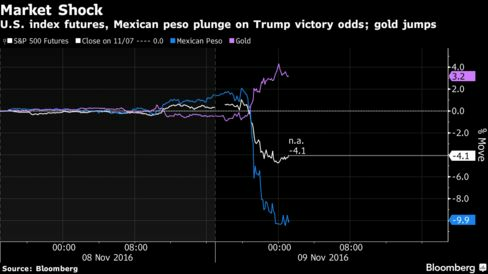 Mexico’s peso tumbled the most since 2008 amid concern U.S. trade policies will become more protectionist under Trump. 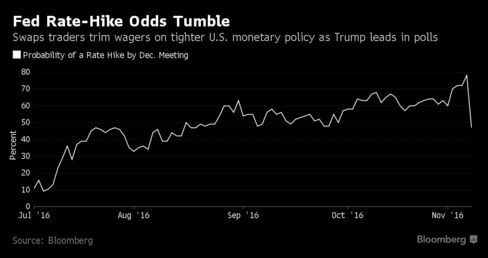 The dollar pared losses and Treasuries trimmed gains after Trump appeared before supporters. S&P 500 futures tumbled by the maximum 5 percent loss permitted on the Chicago Mercantile Exchange before trading curbs are triggered, then pared their decline to 1.8 percent as of 8:10 a.m. in London. The restrictions last came into force in the wake of the Brexit vote and set a floor price for the contracts through the remainder of the overnight trading session. Equity indexes in Germany and France fell at least 1.5 percent. Benchmarks in India, Japan and New Zealand posted the biggest declines in the Asian region. Currencies Mexico’s peso plunged to a record 20.7818 per dollar and was the worst performer among currencies worldwide. Other higher-yielding currencies sank, with South Africa’s rand weakening 2.7 percent and South Korea’s won down 1.3 percent. Currencies viewed as havens strengthened, with the yen climbing 1.6 percent. Bonds Treasuries rallied as traders saw the likelihood of the Federal Reserve interest-rate increase in December dwindling to less than 50 percent, based on overnight indexed swaps. The yield on the 10-year note declined as much as 14 basis points before paring the drop. Its daily trading range — 0.18 percentage point — was the largest since June 24, the day after the Brexit vote.